The Obama Foundation is detailing its plans for the former president's museum and library. We're getting our first look at the design for the Obama Presidential Center. Former President Barack Obama and former first lady Michelle Obama unveiled the plans Wednesday — a little less than two years after announcing Chicago would be home to the museum. "With a foundation on the South Side of Chicago, we'll be able to give something back home after this incredible journey," Barack Obama said. 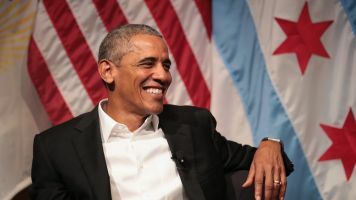 The Obama Presidential Center, which is expected to open in 2021, will actually comprise three buildings situated around a public plaza. Besides a museum, the campus will offer classrooms and meeting space for education programming, house the foundation's offices, and could even house a branch of the Chicago Public Library. It will also have an auditorium, a restaurant and garden. The campus will be built with sustainability in mind. The buildings will have a minimum LEED v4 platinum certification, and two of the buildings will have planted roof terraces. The entire Obama Presidential Center will be situated in historic Jackson Park, overlooking the park's lagoon. The goal is to "re-establish the South Side's connection to the Lagoon and Lake Michigan." The Obama Foundation said Wednesday the current plan will add green space to the park. "More than a library or museum, it will be a living, working center for citizenship," Obama said in an Obama Foundation video posted on his last day in office.